Perhaps it is the recent commercial success found for the monochrome – especially white – canvases of the Arte Povera movement and the ZERO group that accounts for the dominant theme of September’s Asia Week in New York. Alternatively, it may be simply that the purity and subtlety of monochrome wares have rarely lost their appeal to collectors in the East or West. Either way, gallery shows and the salerooms are exploring the theme in a variety of media. 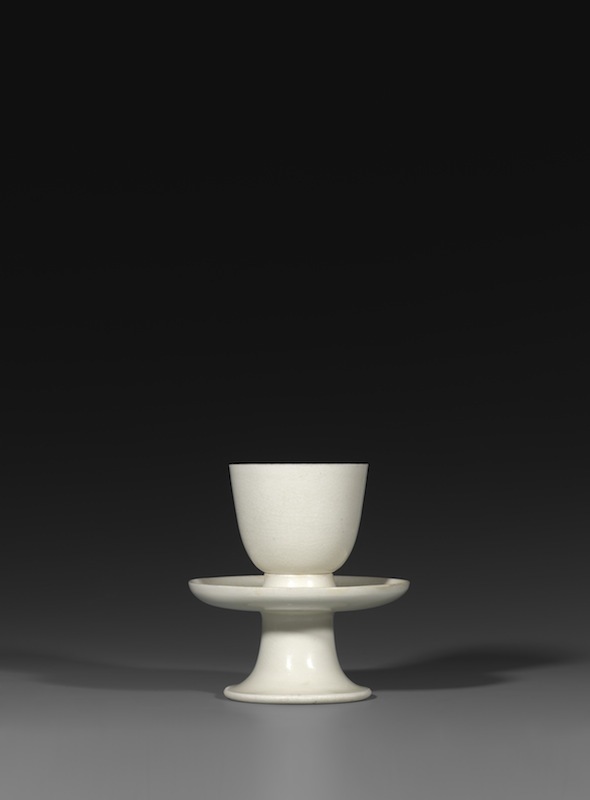 J.J. Lally & Co., for instance, presents ‘Early Chinese White Wares: The Ronald W. Longsdorf Collection’ (11 September–3 October). The earliest piece on offer is an austere and finely potted undecorated ‘U’-shaped cup with a matching pedestal stand from the Sui dynasty (589–618); other highlights include 12th-century productions from the Ding kilns of the Northern Song or Jin dynasty. These later wares often have knife-cut foliate and barbed rims imitating silver prototypes, and a particularly fine 10th-century pentafoil dish here bears elegant lotus-petal brackets and a characteristic glossy glaze of the palest ivory tint. Prices range from a few thousand dollars to almost half a million. Cup and pedestal stand, Sui dynasty (589–618), Xing or Gongxian stoneware, ht 14.6cm. J.J. Lally & Co.
Sotheby’s New York, meanwhile, introduces its latest ‘concept sale’: ‘Monochrome’. Not confined to porcelain wares, this 15 September sale encompasses everything from traditional tea-ceremony ceramics and classical Chinese huanghuali furniture to 20th-century ink paintings and contemporary ceramics. Christie’s sales inevitably also feature monochrome works, not least a large Chinese celadon-glazed moon flask. Here a clean silhouette is contrasted by a crisply carved dense floral decoration, the pooling of the glaze providing subtle variations of colour as well as texture. Bearing the six-character mark of the Qianlong period (1736–96), it is the star offering in Christie’s two-day Fine Chinese Ceramics and Works of Art sale on 17 and 18 September (estimate $1m–$1.5m). 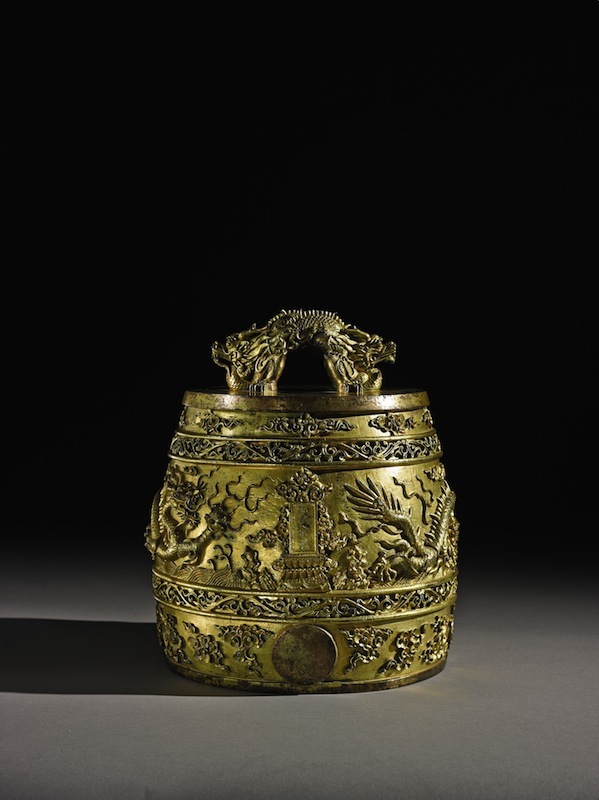 Also bearing the imperial Qianlong mark and period is the extraordinary gilt-bronze bell of 1743, again offered by Sotheby’s New York, in its two-day Important Chinese Art sale on 15 and 16 September. William Randolph Hearst had acquired this opulent rarity from the Japanese dealer Sadajiro Yamanaka in 1921. Sets of ceremonial bells played a key role in court ritual, and the Qianlong emperor used examples old and new to reinforce the legitimacy of his reign. While these new productions were modelled on ancient Zhou prototypes, they were, strikingly, gilded rather than given the green patina of the originals. This finely cast example, which would originally have been part of a set of 16 producing 12 musical notes, is surmounted by a pair of addorsed dragons – a symbol of imperial power and strength. More dragons set amid roiling seas and fiery clouds ornament the bell’s central frieze. Although imperial Qianlong bells are rare, two identical examples survive at the Château de Fontainebleau, looted from Beijing and presented to Napoleon III and Empress Eugenie in 1861. This example cannot fail to interest Chinese buyers (estimate $1m–$1.5m). In Paris, the Japanese/American exchange is also the focus of Piasa’s ‘thematic auction’ on 16 September. More than 60 works by the American-born designer and craftsman George Nakashima – including some 20 pieces made by Nakashima Studio under the supervision of his daughter Mira – are included in this monographic sale. Nakashima, who studied in Paris, learned traditional Japanese carpentry techniques when interned in Idaho during the Second World War, and combined them with a passion for both the natural state of wood and a modernist aesthetic. The latter is evident in the 1947 walnut and canvas Long Chair (€60,000–€80,000) and a chest of drawers of 1963, also in American walnut (€30,000–€40,000). The piece is one of many featured in William Wegman’s series Dogs on Furniture – a suite of stylish, witty photographs featuring Wegman’s beloved Weimaraners – commissioned by Piasa and part of a larger sale auction of the US photographer’s work on 16 September. In 2013, after a 12-year legal battle, the High Court of Paris awarded the heirs of Henri d’Orléans, Comte de Paris, works of art and insignia from the French royal collections that he had donated to his Fondation Saint-Louis in the Château d’Amboise in 1976. (The heirs were not, however, awarded the family castles and other properties they also claimed.) Now 200 of these objects are to be offered by Sotheby’s Paris on 29 and 30 September. This cadet branch of the royal family had ascended the throne with Louis-Philippe in 1830, and these works of art had followed the family into exile, first in England in 1848, then Belgium and Portugal, before returning to France in the 1950s as the law allowed. 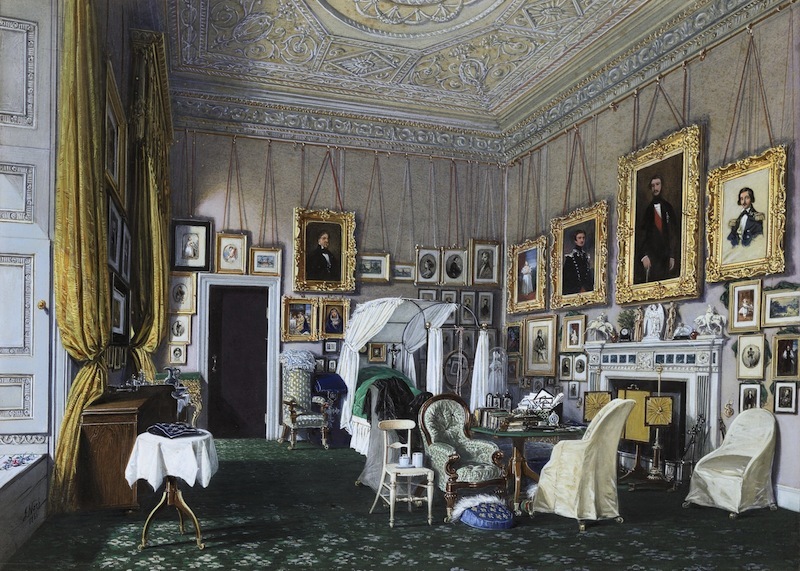 As we see from Joseph Nash’s watercolour of the bedroom of Queen Marie-Amélie at Claremont of 1866, family portraits crowd the walls of her English retreat (€25,000–€35,000). Sale highlights also include Nicolas Bernard Lépicié’s charming portrait Louis-Philippe, duc de Valois, au berceau of 1774 (€150,000–€200,000) and the 1821 portrait of his eldest son playing in the courtyard of the Lycée Henri IV, by Horace Vernet (€50,000–€70,000). Other highlights include a child’s drawing table by David Roentgen (€150,000–€250,000), probably a gift to the future Louis-Philippe and his siblings from their grandfather the duc de Penthièvre, a loyal patron of Roentgen; and an ornate porcelain Sèvres breakfast service known as the Chasses Diverses delivered to Marie-Amélie in 1840 (€100,000–€150,000). On 18 September at Koller Zurich, 60 Italian illuminated manuscripts go under the hammer, drawn from a private collection amassed over three decades. The highlight here is an antiphonal sheet illuminated by Neri da Rimini around 1314, the letter ‘L’ incorporating an image of Moses receiving the Tablet of the Law (CHF 30,000–CHF 45,000). Galerie Fischer of Lucerne, meanwhile, features a grand 16th-century Milanese silver shield in its Antique Arms and Armour sale of 10–11 September. This silver-plated iron roundel is decorated with various episodes of the Perseus myth, including our hero flying in on Pegasus to save Andromeda by killing the sea monster Cetus and flying off again with the head of the gorgon Medusa. Executed around 1560–70, it is expected to fetch CHF 44,000–CHF 60,000. Earlier in September, as Florence prepares for its 29th Biennale Internazionale dell’Antiquariato (26 September–4 October; see pp. 42–43), Moscow presents the latest edition of the young contemporary art event Cosmoscow (11–13 September). The fair moves this year to its grand new venue of Gostiny Dvor, built by Catherine the Great’s favourite architect Giacomo Quarenghi in 1789, and anticipates the Moscow Biennale of Contemporary Art (22 September–1 October).